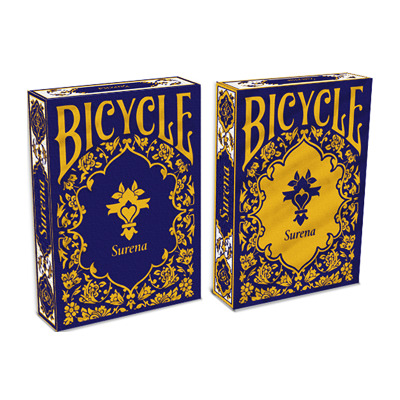 An interplay of Persian Art & History is presented in this collection of original hand-drawn art as a deck of playing cards. Surena means "The heroic one" and he was the commander in chief that represents a symbol of struggle, strength and victory in the quest for freedom and independence of the Persian people. Legends, etchings, books, Persian art and history are some of the designer's inspiration. Each suit is represented by different patterns used in traditional and famous Persian rugs. The jokers are also inspired from traditional elements and backs have a luxurious look with gold accents.